This is a scalable context timeline. It contains events related to the event June 26, 2008: Conservative Commentator Crowley Repeats Falsehood that Obama Is ‘Arab-African’. You can narrow or broaden the context of this timeline by adjusting the zoom level. The lower the scale, the more relevant the items on average will be, while the higher the scale, the less relevant the items, on average, will be. Sean Hannity. [Source: Halogen Guides (.com)]Conservative radio show host Sean Hannity tells his listeners that Democratic presidential candidate Barack Obama “can’t point to a single instance in which President Bush or [Republican candidate John] McCain or [Bush political adviser] Karl Rove or Sean Hannity or talk radio or any other major Republican has made an issue of Obama’s race.” Hannity’s claim is proven false by data collected by progressive media watchdog organization Media Matters. 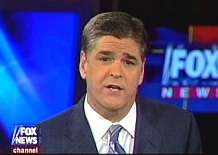 Hannity himself asked his audience on March 2, 2008, “Do the Obamas have a race problem of their own?” He has also repeatedly distorted the content of Michelle Obama’s 1985 Princeton University senior thesis to suggest that Mrs. Obama believes, in Hannity’s words, “blacks must join in solidarity to combat a white oppressor.” (Mrs. Obama was documenting the attitudes of some black Princeton alumni from the 1970s and not expressing her own views.) [Media Matters, 8/7/2008] Media Matters has also documented numerous examples of other radio and TV personalities making “an issue of Obama’s race” (see January 24, 2007, February 1, 2008, May 19, 2008, June 2, 2008, June 26, 2008, and August 1, 2008 and After). The issue of race will continue with conservative pundits and radio hosts (see August 25, 2008, September 22, 2008, October 7, 2008, October 20, 2008, October 22, 2008, October 28, 2008, and November 18, 2008). Rush Limbaugh, the nation’s most popular conservative radio talk show host, tells his listeners that Democratic presidential candidate Barack Obama was nominated because “nobody had the guts to stand up and say no to a black guy.” As documented by progressive media watchdog organization Media Matters, Limbaugh, while complaining about “how unqualified Obama is,” says, “I think it really goes back to the fact that nobody had the guts to stand up and say no to a black guy.” Limbaugh continues: “I think this is a classic illustration here where affirmative action has reared its ugly head against them. It’s the reverse of it. They’ve, they’ve ended up nominating and placing at the top of their ticket somebody who’s not qualified, who has not earned it.… It’s perfect affirmative action. And because of all this guilt and the historic nature of things, nobody had the guts to say, well, wait a minute, do we really want to do this?” Limbaugh, in a conversation with a caller, prefaces his comment by saying that “liberals” oppose racism except “when it benefits them… [s]o when, when a precious resource like racism becomes scarce… they will go out and drill for new sources.… You’re exactly right. They understand the principle. They want it for themselves, just not anybody else. Liberals can have two sets of rules: One for the elites, the arrogants and the condescending elites, and the other set of rules for everybody else.… They will exempt themselves from the limiting rules they place on everybody else.” He concludes that Obama’s nomination is “perfect affirmative action. And because of all this guilt and the historic nature of things, nobody had the guts to say, well, wait a minute, do we really want to do this? So they do it and then they start behaving in manners and ways that let us know that they know that they’ve goofed up with the choice. Actually, it’s been somewhat fascinating to watch.” [Media Matters, 8/20/2008; Guardian, 8/24/2008; Der Spiegel (Hamburg), 8/27/2008] Limbaugh and other radio hosts have repeatedly used Obama’s race as a springboard for numerous false and unsupported allegations (see January 24, 2007, February 1, 2008, May 19, 2008, June 2, 2008, June 26, 2008, and August 1, 2008 and After).